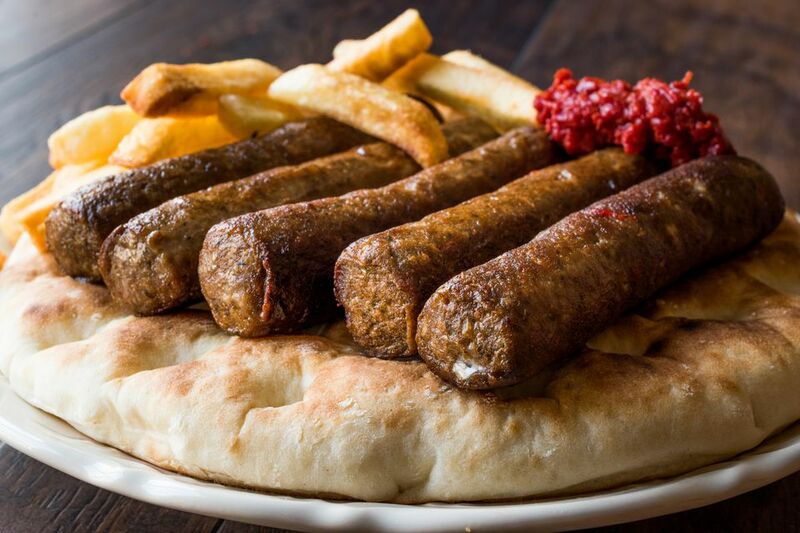 The casing-less Balkan sausages known as or cevapi, cevaps, or cevapcici found their way into Eastern Europe via the Ottoman Empire, which picked them up from Arabic cultures around Persia. Today, there are different versions of this fresh, unsmoked sausage throughout Croatia, Serbia, Bosnia-Herzegovina, and Macedonia. Some use pork and lamb, others use pork, lamb, and beef as in this recipe, and yet others omit the pork entirely. If anything is consistent, it's that they are formed by hand and not stuffed into casings and the meat mixture has lots and lots of garlic. Originally, they were skewered and grilled over an open fire. Nowadays, most cooks grill, broil or pan fry them. They make great appetizers and sandwiches on lepinje bread. In a large bowl, mix together beef, pork, lamb, garlic, 1/2 cup chopped onions, and salt until thoroughly combined. To make sure your seasonings are just right, make a small patty and fry it to taste test. Add more garlic, salt, or onions to suit your palate. Refrigerate the meat mixture, ideally overnight, ​before forming. To make the sausages by hand, roll the meat mixture into a long, 3/4-inch cylinder. Cut links at 4-inch intervals. If you prefer, you can use a sausage extruder without a casing attached. Place the sausages on a plastic wrap-lined plate, cover with more plastic wrap and refrigerate for 1 hour to firm. They now can be cooked. Broil cevapcici on a charcoal grill or a heated oven broiler rack coated with cooking spray 4 to 6 inches from the flame, 4 minutes per side or until no longer pink in the middle. Or they can be pan-fried in a large skillet coated with cooking spray over high heat for a total of about 8 minutes, turning frequently to brown all sides. Serve with chopped raw onion, Serbian potato salad, and pogacha bread. These sausages can be frozen after they are formed by arranging them on a parchment-lined sheet pan spaced well apart. When fully frozen, transfer them to a zip-top freezer bag. To use, remove as many or as few from the freezer bag as you like. They can be thawed and cooked or cooked while frozen to good effect.